Aral Balkan has posted information for local hubs for his upcoming Singularity Web Conference, and I've started a discussion on the Google Groups list for the local Portland, Oregon hub. More details will be worked out in the coming weeks, but if you'd like to help out and or have any suggestions, join the conversation! 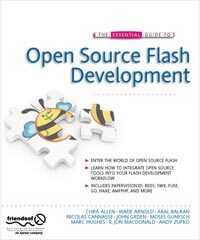 I am super late in posting this, but the book in which I recently co-authored, The Essential Guide To Open Source Flash Development, was released toward the end of July and is available for purchase. The book covers a completely open source work flow for Flash and Flex developers, as well as providing concrete examples and documentation for some of the most popular open source projects, including: PaperVision3D, SWX, Red5, Fuse, and AMFPHP. I contributed the chapter on SWX, featuring both mobile and website uses with the p.i.n.k. Sprits website as a case study. More details can be found on the Friends of Ed website. Marc Hughes, one of the main authors on the project, also has a good write-up on his blog. Overall, I really enjoyed the experience of writing and hope to continue to do so in the future. If I learned anything, it is how much time and effort really goes in to these books -- I can't imagine what Colin Moock must have felt like writing the massive 1000 page effort that is Essential ActionScript 3.0. Just getting the 40 pages I wrote through the whole publishing system took over a month, including writing, technical and editing reviews, page formatting and proofing. All of this has led me to start thinking about why as a developer I own such a large and ever-expanding library of printed material. The photo to the right is of my library of work-related books. Mostly reference material and inspiration, but all in print. To this day I still buy printed copies of books even when a PDF version is available. As a developer who helps create digital experiences, shouldn't I be trying to help expand the digital world? I doubt that I'll ever stop buying printed materials, but the notion is certainly one to think about.